The Fengari Dance Group was established in 2001 from a small group of enthusiasts in North London. Our dance classes and dance school were our way of keeping the dances & variations we learnt and loved alive. Emphasis in the classes is on learning and fun in a friendly atmosphere. The dances we teach you will find useful for most social events. The dance school is totally independent and we are not affiliated with any other group or organisation, therefore we welcome the support from our loyal students. What sets us apart from the competition? Well, simply we have a no commitment philosophy to our classes. You pay as you go. The commitment comes from you the dancer and student. 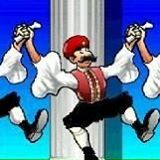 Although Fengari Greek Dancing is not a singles meeting place, at least four marriages have resulted from people who met each other on our dance floor.